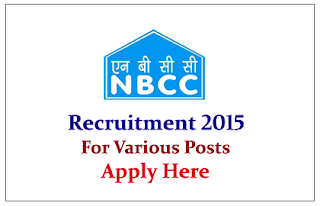 National Building Construction Corporation Limited is recruiting for the various posts for the year of 2015. Eligible candidate can apply here on or before 7th July 2015. National Buildings Construction Corporation Ltd. (NBCC), is a blue-chip Government of India Navratna Enterprise under the Ministry of Urban Development, with consolidated revenue of INR 5000 Crore. Listed with both the Stock Exchanges, the companys unique business model has today, made it stand out as a leader in its own right in the construction sector with more than INR 20000 Crore Order Book in hand and counting. Eligible Candidates can apply online on or before 07.07.2015. For more details kindly check Official Notification.